Does This Tuned Mazda MX-5 Look Like A Ricer Or A Beast? There’s a thin line with tuning a car. The Mazda MX-5 Miata isn’t really seen as a “manly car,” but it may be sports cars on the road today. To give the sports car a more aggressive look, Kuhl Racing ( Nissan GT-Rs) gave the vehicle some questionable performance parts. 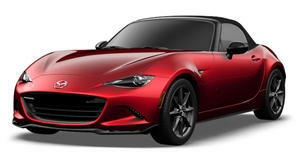 In the US, the MX-5 comes with a 2.0-liter four-cylinder engine, but Japanese enthusiasts are stuck with the lighter, less powerful 1.5-liter engine. To make up for this, Kuhl Racing gave the sports car a menacing appearance. Did it work or is this MX-5 a hideous sight? It’s hard to miss Kuhl Racing’s aggressive front end that features four massive vertical blades for a look that reminds us of fangs or loose teeth. Then there’s the gaping grille that looks like an open mouth. The MX-5 already came with a questionable front end from the factory, but Kuhl Racing’s body kit is even more unsightly. There are side skirts and a rear bumper that features an integrated diffuser, which is truly ghastly. The Japanese tuning company also offers LED rear lights, a swan neck GT wing for an additional $900 and other accessories to ensure that you will never lose the sports car in a parking lot. As far as performance, Kuhl Racing offers customers its own “Slash 2” exhaust system for an extra $1,000 that gives the tiny 1.5-liter engine a more ferocious bark. The exhaust system is made out of 100-mm steel piping and is centrally mounted with a Heat Blue treatment for a better look. So is this the meanest MX-5 around or something that should only come out on Halloween?